American Kathleen Mulcahy has been fighting with her weight for 55 years. “My parents had a baby, a son, and he died at birth,” she says. “I was seven and I think that was the time I started to gain weight.” Mulcahy remembered that, a few years later, her mother died and she gained more weight. “By the time I got out of high school, I weighed 260 pounds,” she said. That is almost 120 kilograms. A 2017 study found that one-third of the world’s population is overweight or considered obese. The problem of obesity worldwide affects three times as many people as it did in 1975. That fact comes from the World Health Organization. Obesity is no longer just a problem for the United States and other industrial nations. There is a growing number of overweight and obese people in other countries. Being overweight has been linked to more deaths around the world than being underweight. Dana Hunnes teaches at the Fielding School of Public Health at the University of California Los Angeles. She says fast foods, soft drink companies and other businesses are having a major effect on the overweight and obesity epidemic in developing countries. She adds they are adding calories and processed foods, with salt and sugar, into the diet that many people have not been normally eating. In addition to diet, the way people live in developing countries is changing. As people move to cities and earn more money, they become less active and “they’re putting on weight and following the pattern of the United States,” noted Hunnes. 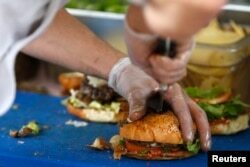 FILE - French burgers are prepared at 'Le Refectoire' food truck in Paris, Nov. 16, 2012. But there is another reason why people are gaining weight around the world, said psychotherapist Deena Solomon. “People are moving away from their family,” she said. “They don’t have the support system that is going to help them.” Solomon noted that many people turn to food to help them deal with the pressures of everyday life. While popular diets may help with fast weight loss, staying thin is difficult. “(The) studies…show that plant-based diets are good long term,” said Hunnes, who added that eating less meat helps with weight loss. Solomon helps people with weight loss by working with the mind to change a person’s eating behavior. Solomon said she once weighed 102 kilograms, but then lost 32 kilograms, which she has kept off since then. She wrote a book on weight loss and helps people like Mulcahy think about the food she eats. Solomon asks overeaters to keep a record of everything they eat. She says that knowing what is eaten, and controlling it, becomes more powerful than the desire to eat. The way we think about food is “important when it comes to diet,” said Hunnes. How different cultures think about different kinds of food can help influence what people eat and their weight. Hunnes said the western diet is not healthy and can be a cause for cancers, heart disease and other health problems. Eating a lot of meat adds to the problem. The west, she said, should eat fruit, vegetables and plant fiber. Elizabeth Lee reported this story for VOA News. Susan Shand adapted it for VOA Learning English. George Grow was the editor.